Yes, it’s that time of year again — some members of the Department are off to attend annual conferences (in Baltimore this year). You’ll find them in sessions, running between sessions to get to a session, presenting their research at a session, or lost in the sea of humanity (pictured above) in the book display killing time between sessions. 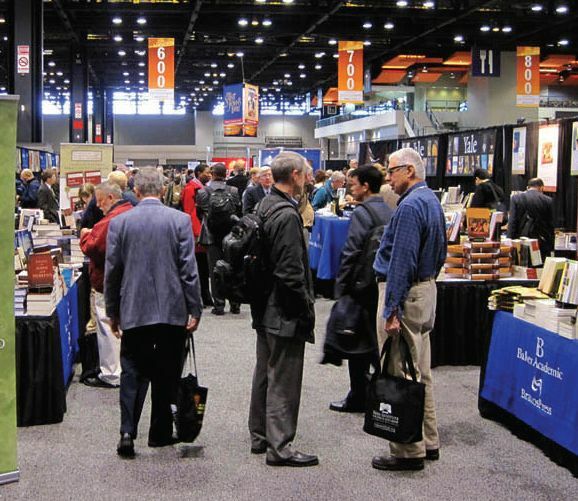 Did you catch the interviews from last year’s annual meetings in Chicago? We’ll be filming some more this year but until then, you might enjoy looking over our shoulder to see what these conferences are all about. And keep an eye out for a pic or two if we bump into anyone who knows us. This entry was posted in Faculty Blog, Religion in Culture and tagged American Academy of Religion, North American Association for the Study of Religion, Society of Biblical Literature by Russell McCutcheon. Bookmark the permalink.